Walking in the clouds – at Visapur! The clouds are heavy, the sky is set. One day of adventure, we know we will get. With nature some time we wish to spend. We silently hope for the day to not come to an end. Early Saturday morning, I was awoken by a noise. It wasn’t the alarm clock. I thought it was the sound of heavy rain hitting against my window. Wait. Rain? Rain! It was finally raining! There was an instant surge of excitement in me! If it was raining here, then it must be raining in Lonavala for sure. So the IMD had made a precise forecast after all. Dressing up as fast as I could, I was eagerly awaiting the Man in-charge (MIC) Rushikesh’s call. Had the Breakfree Bus left on time? How many people were finally joining us on the trek? What would the weather over there be like? So many questions were flooding my head. So much excitement was running through me. Boy! It was going to be a fantastic day. I just knew it. Finally, at 5.30 am, I received an SMS from Rushikesh. The Breakfree Bus had left well on time. The next 15 minutes were spent in anticipation, randomly walking around the house, last minute checks, and glancing at the watch again and again. I reached Kalanagar by 6 am, eagerly waiting for the bus to come. All good things come at a price, we’re always told. Waiting for the bus, the raindrops left us cold. Eagerly looking forward, we were, to the journey ahead. The excitement on our faces any soul could have read. By 6.20 am, the Breakfree Bus was there! This was not the bus we usually hired, but who cared! As long as it was there and as long as we were going to Lonavala, all was well. The next stop was at Sion which was barely away. As usual, the Sion crowd was punctual and we heaved a sigh of relief as a couple of trekkers hopped in. There weren’t going to be any more delays, after all. Raining. On the express way. As the last two trekkers arrived, the Breakfree Bus took off and we realised that our journey had finally begun. The initial few minutes were spent in catching up with old pals, HIs and hellos and catching a good forty winks, too! So with a few (short) stops at the petrol pump and the food court (the vada pavs were delicious!) 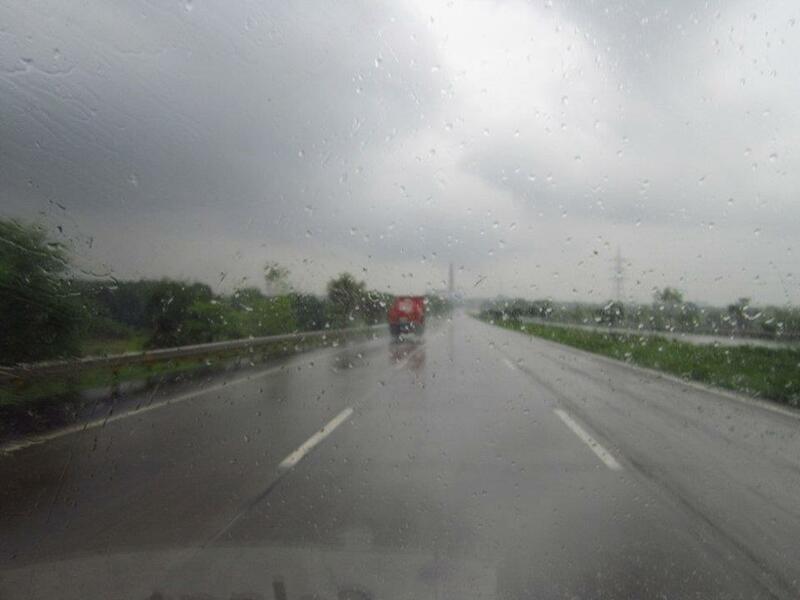 we were getting closer and closer to our destination – Visapur. This time, we had decided to not take the inner roads of Lonavala and went ahead from the Express way instead. The weather was delightful and the showers only added to the pleasant atmosphere, the cool winds and our overly brimming excitement! The monsoons had arrived, and how! The roads were filled with Mumbai based cars. People were flocking to the hills to enjoy the rainy weekend. That caused a slightly delay due to heavy traffic, but that was OK. Everybody had a right to enjoy the beautiful weather, didn’t they? En route Visapur, we were greeted by a panoramic view of the great mountains, green pastures, running rivers and newly formed waterfalls. There was silence in the bus as all the trekkers sat on their seats, looking outside the windows, observing the beauty of nature with awe. Somewhere in our minds, we were also wondering which of the great mountains we just saw, was the one we were going to climb. Looking out of the window, only fresh air we could smell. Who would have thought that one of these mountains, we were soon going to climb? Having crossed the Malavli railway station, soon, by 9 am, we reached the base (this new driver drove the bus like a boss!!). The bus was filled with activity – trekkers grabbing their bags, some changing into their special Action trekking shoes, some picking up their windcheaters & cameras and some rushing outside to locate a washroom! Once everyone was out, we moved into Jay Malhar, a local eatery, for breakfast. Breakfast was a lavish affair with unlimited kanda poha (why! We need to fill our tummies before we start on our long trek) and chai (a beautiful weather like that would have been incomplete without the chai!). Post breakfast, we found a local guide named Sudhir who would guide us to the peak. Following the traditional Circle of Introduction, we started with the journey that was sure to remain etched in our minds forever. At 9.45 am we started the trek. Sudhir led the 12 enthusiastic trekkers through the path. We had to climb a series of stone steps. Although we made faces initially for having to go on apparently easy to climb steps, we soon realised that steps, were in fact, extremely difficult to climb. (Ouch, the knees!) After having climbed some 75 steps, Sudhir led to an opening – into the mountain. Ah! Mountain! It immediately gave us a feeling of nostalgia and a sense of familiarity. Hadn’t we climbed so many mountains before? Divided into groups, we continued our climb upwards. What we saw was exceptional beauty! Small villages, the express way, the railway track, the green pastures – all of it looked miniature and divine! 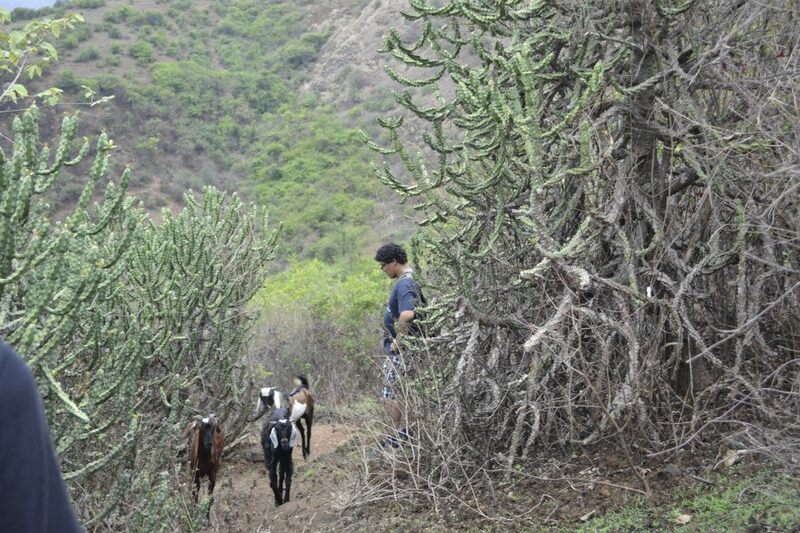 Added to it were Sudhir’s anecdotes about the village, the mountains, the animals and birds. It had started pouring now. Light showers, not much. Most of the windcheaters were out already! By 11.30 am, we reached a clearing where we saw the remains of a house and a shed. That is when not-so-funny stories about haunted housed, bhooth bungalows and ghosts began to surface. However, we were shocked out of our wits when Sudhir told us that there were a couple of locals who had committed suicide from that very mountain!! Wide eyed, we started walking ahead – reluctantly, but quickly. Sudhir was playing the role of a guide to the tee. Sharing stories and experiences of his life in the village, he was leading us to the top. Just a short way into the mountain, he suddenly turned behind and softly asked to observe a deer which was barely 100 metres away from where we stood! However, in all our excitement at having spotted such a beautiful creature, we were too loud and the deer ran away and vanished somewhere behind the hills. It was then that Sudhir told us, that the forests on the mountain had been cleared very recently. This caused quite a lot of animals to come out in the open to hunt. It is, but impossible, to avoid the beautiful falls. As we move, all apprehensions, we put to rest. As we walked ahead, uphill, we were surrounded by ‘karavanda’ bushes (and innumerable crabs, too!). Walking ahead, we managed to pluck a few of the berries and boy, how sweet they were! There were plenty of Jamun trees, too! Didn’t we feast on fruits and berries? – First the mangoes, then the karavandas and now, jamuns! Just a little distance from the jamun trees was another clearing on the mountain. It was from here that we could see Visapur’s twin fort – Lohagad. Visapur fort is built on the same plateau as Lohagad, but as it is on a higher elevation than its twin fort, we got a beautiful view of Lohagad en route Visapur. We spent quite some time here, with all the cameras and binoculars out. The weather was so beautiful and refreshing that it was quite a task for the MIC to get everyone moving again! A little saddened at having to vacate the beautiful sight, but enthusiastic about reaching Visapur all the same, we followed Sudhir with discipline. That was when Sudhir mentioned about two routes to the fort – one easy, but long and another short, but difficult all the same. But because it had rained and the path was slippery, it was decided that we would take the easier route up. A little while into our walk ahead, we came to the caves where we took a short break – just to sit, relax and of course, click pictures! After the short pause, we started following Sudhir up again. We had reached high up to be able to see the Visapur fort now! What a sight it was! 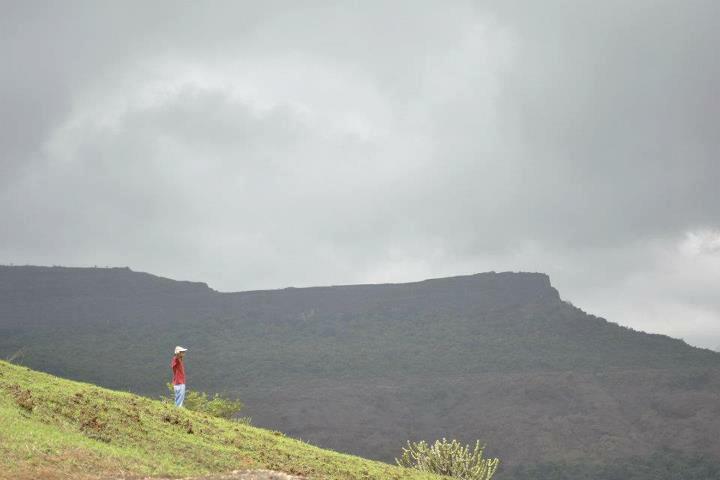 With renewed vigour, the trekkers starting climbing the rocks again, only to reach the peak and enjoy the fort! By 12.15 pm, we finally reached the top. It was only when all of us reached atop that we realised, that the rain gods indeed were pleased with our efforts, for it started raining again! It started with a slight drizzle, but we could see a gigantic cloud approaching us! The view was panoramic. It was picture perfect. The fort walls were huge and the fort, enormous in size. It took us a good twenty minutes only to reach the other end of the fort! By now, the cloud was upon us and we were expecting the rains to hit us any moment! 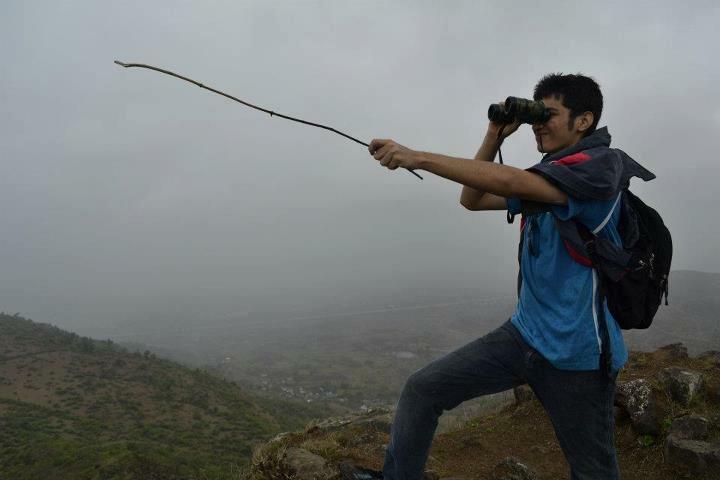 The trekkers were seen running around the peak like excited little children and yes, the cameras were out again! What followed was a series of photo sessions, excited sigh seeing, and playful banter. The winds brushing across our face, we could feel. At nature’s feet forever we could kneel. How could we explain the inexplicable high? How would we explain why we were feeling so spry? As we enjoyed our time at the peak, the cloud came over us and finally burst!! 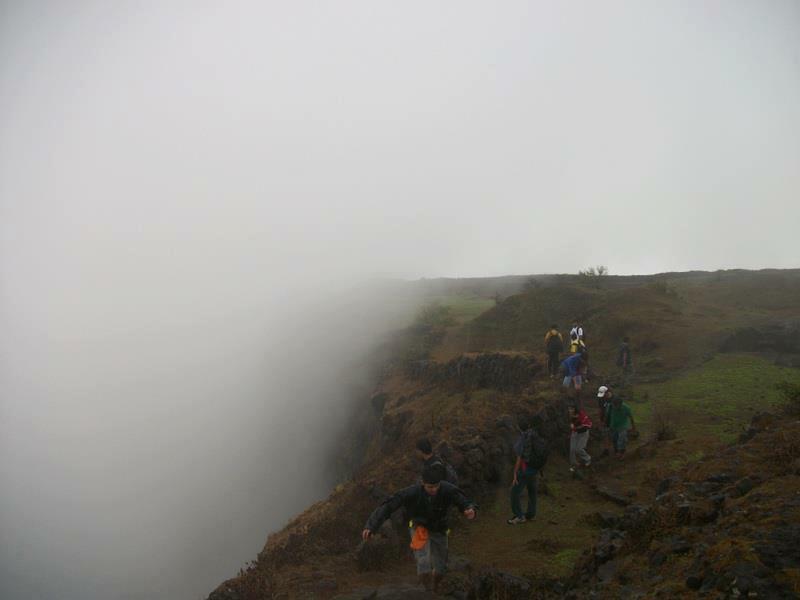 It started raining heavily and the delighted trekkers jumped with joy! We forgot how hungry we were supposed to be and were lost in enjoying the rain! After having spent a good 45 minutes on the peak, the MIC, Rushikesh, was concerned. 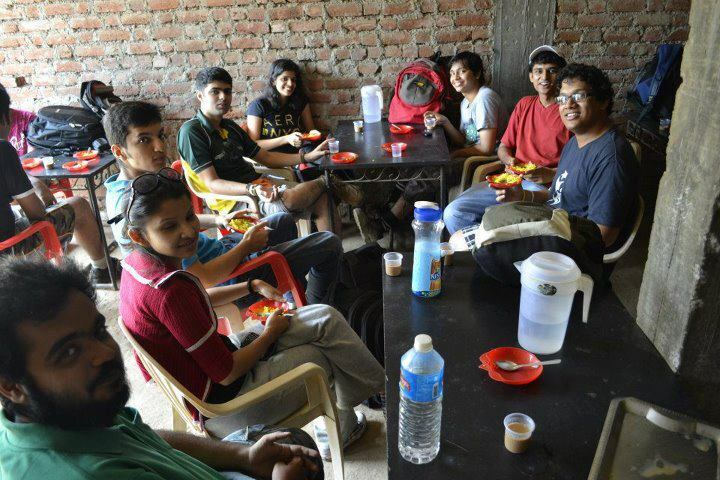 We had to have our lunch – the misal pav that we had packed from the base. But that wouldn’t be possible in that kind of heavy rain. So we decided to move down to the caves and relish the local fare (with a heavy heart). Descending, we decided to stop at what we called a temporary refuge – a cave like structure that we thought would provide us some shelter from the rain. This was when the theplas, cakes, chocolates and mangoes were out again! We relished the semi-lunch and headed for the caves again. Drenched, we finally reached the caves which had a gigantic Hanuman (Maruti) carving welcoming us at the entrance. In no time, we divided ourselves into groups of 4 and settled to have our lunch – delicious, spicy missal pav! The spicy food got us to forget the chill that we felt at having been drenched! Rejuvenated, the 12 trekkers started the descent after the hearty meal and a nice break. Once the others returned, we sat at the steps – relaxing and already reminiscing the wonderful trek that we had just completed. After a little snack consisting of kurmuras, we headed back to the bus – dry by now – to go and change. But as luck would have it, it started pouring again and we were drenched, once again!! 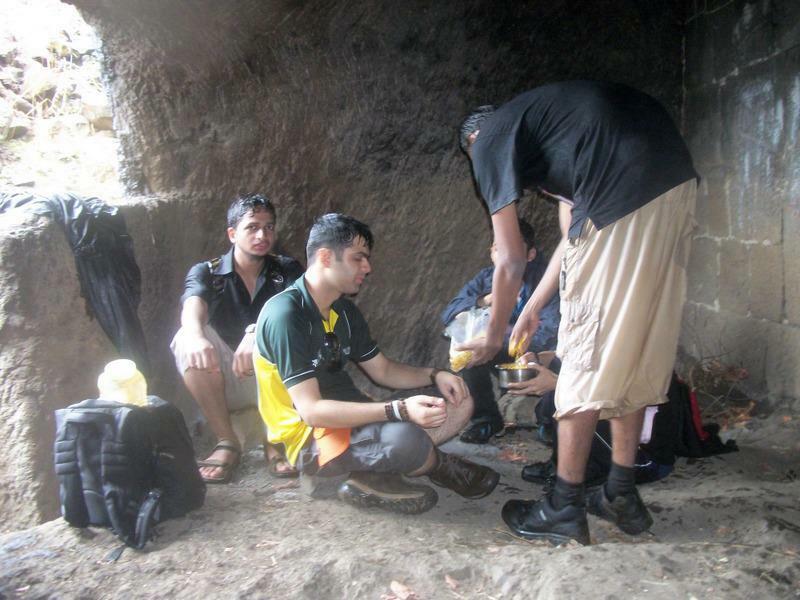 After a quick change, we picked up a parcel of steaming hot vada pavs for the victorious, hungry trekkers. By 4.30 pm, we had hopped into the bus and were ready to take off for Mumbai again. Like I have mentioned every time, return journeys are always a happy-sad affair for me. 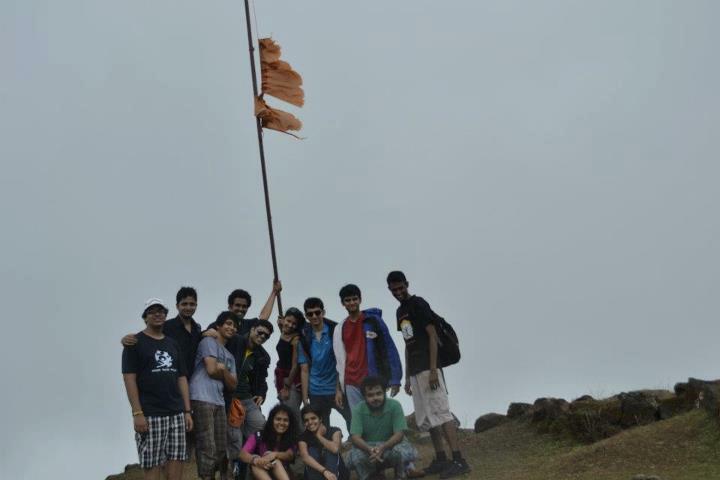 They make me cherish the wonderful trekking experience, but also rue the end of the amazing experience. The return journey was filled with conversations and random songs, not to mention, a good nap for quite a few. Soon, we reached Mumbai and thereby came the end of another beautiful day with nature. Not one moment of the wonderful time, would we ever repent. We have not just a feeling of exhilaration, but also pride. A big thank you to Ameya, Rahul, Farica and Aishwarya for the beautiful photos! This entry was posted in Breaking Free!, Travelling with K and tagged Black Drongos, Breakfree Journeys, clouds, Green bee eater, Indian Robin, Lonavala, mountains, Oriental Magpie Robin, trekking, Visapur. Bookmark the permalink. Such an awesome write up! Felt like I was actually doing the trek again!